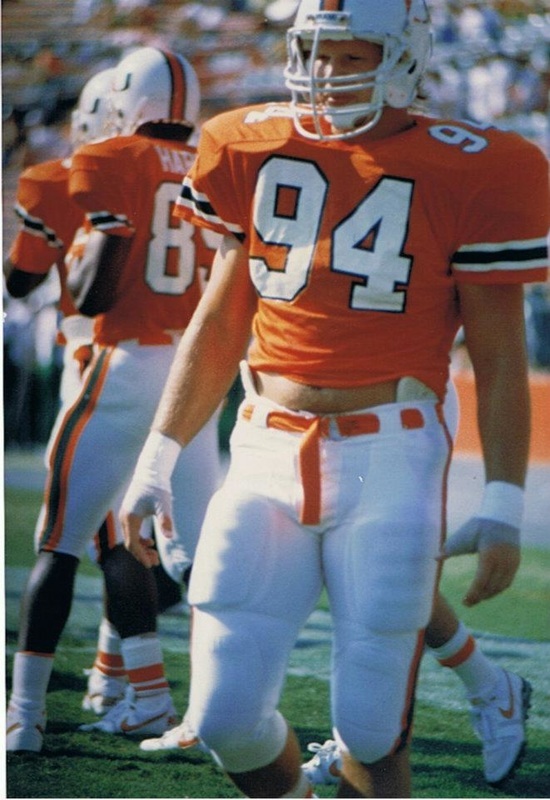 From 1986-89, Greg Mark anchored one of the most punishing defensive lines in University of Miami football history, as well as in college football. Greg's five-year career at Miami culminated with First-Team All-America honors by Kodak and the Associated Press in 1989, as well as a semifinalist nod for the prestigious Lombardi Award. Greg was also part of two national championship teams at UM, in 1987 and 1989. He finished his career with 35 starts, 253 tackles, 95 quarterback pressures and 34.5 total sacks. After his playing career in the NFL, Greg returned to Coral Gables as a graduate assistant in 1992. He coached at UM through the 1994 season, and then moved to Utah State to coach the defensive line. Greg returned to Miami as defensive line coach in 1996, a position he still holds. His efforts in coaching resemble those as a player, when he oversaw a group in 2001 that was a vital part of the Hurricanes' drive to the National Championship. Greg Mark, the UM defensive linemen, spearheaded a defense that led the nation in scoring defense, pass efficiency defense and turnover margin while ranking in the top 10 nationally in five statistical categories.